If you want a tablet to basically use as a portable TV (that’s basically what my iPad is at this point), a big screen is important, and you’d be hard-pressed to find a better deal right now than a refurbished Fire HD 10 for just $150 today (with code FIRE10), the best price we’ve ever seen. It’s not as fast as an iPad, it doesn’t have as many apps as a standard Android tablet, and its 1280x800 screen is far from spectacular. But if you just want to binge on Westworld while you cook dinner, it’s tough to beat an internet-connected 10-inch screen for this price. Refurbished Fire tablets carry the same one-year warranty as brand-new models, so I wouldn’t let that scare you off. Just be sure to use code FIRE10, and note that supplies are very limited. Continuing a string of deals that can help with your New Year’s resolutions, Amazon is offering a Gold Box deal today on a variety of Vega’s excellent plant-based protein powder and bars. A quick spot check shows prices running about 30 to 40 percent less than you’d pay at GNC, so this is a great chance to stock your cabinets on the cheap. Just remember that like all Gold Box deals, these prices are only available today, or until sold out. 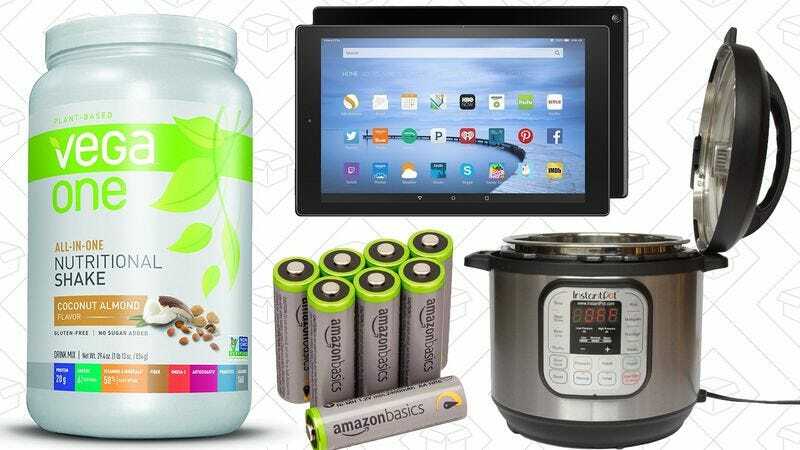 If your Eneloop AA collection isn’t quite as big as it could be, you can supplement it with an 8-pack of AmazonBasics high-capacity AAs for $16 today. That’s an all-time low price and $3 less than the equivalent Eneloop pack. And if you believe some reviewers, these may actually be rebranded Eneloops themselves. We can’t verify that claim (though like Eneloops, they were produced in Japan and precharged with solar energy, which seems really specific to be a coincidence), but whatever their origin, they have great reviews and a stellar price tag. If you don’t own a pressure cooker, today’s a great day to fix that, as Amazon’s knocked the highly rated Instant Pot IP-DUO80 down to an all-time low $129 today. We’ve seen cheaper Instant Pots in the past, but if you’re cooking for a large family, this 8-quart model is the biggest you can buy. If you’re worried that you won’t get a ton of use out of this thing, note that in addition to standard pressure cooking, this is also our readers’ favorite slow cooker and one of their favorite rice cookers, too. To put a fine point on it: It’s one of the most versatile kitchen gadgets you can own. Deals on standard A19 LED light bulbs are a dime a dozen these days, but we don’t see as many good discounts on LED BR30 flood lightbulbs, so stock up and stop wasting energy with your recessed lighting fixtures.